Hello to all our lovely visitors. Today it's my turn to show you my project which resulted from taking inspiration from Jean Hardy's beautiful 'Enveloped Elegance' on page 34 of the February issue of Craft Stamper magazine. 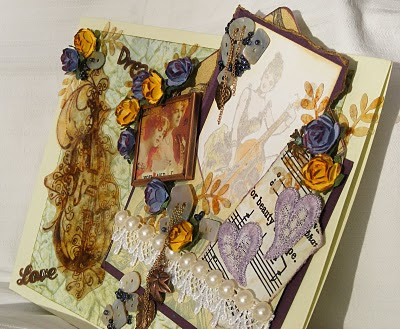 I have to confess, I am totally in awe of Jean's ability to put so much into such a small space and so I have taken a lot of licence and spread mine a little over a larger card base. My excuse is that we never intended to copy but to use the chosen CS project as inspiration so I hope I'll be forgiven, Lol! I've gone with a bit of a music theme. The actual envelope is the same size as the one Jean used and I used a template I already had to make mine from some Laura Ashley paper. There were two shades of the same design so I used one to make a matching envelope liner. I wanted the image (Elusive Images) inside to look faded so used quite muted colours for the stamping and colouring and used a little distress ink round the edges before attaching to a torn piece of card stock. I then arranged the beads, buttons, chain and charm in the corner and adhered them with Glossy Accents. The image in the Ranger glass slide frame is from a Crafty Individuals book. The torn distressed piece of music paper was courtesy of Jo. The crumpled background paper was one I did using Starburst Stains and found in my bit box so I rubbed a Distress Inkpad over the top. Similarly the alcohol ink acetate I used to stamp the lovely cello (Aspects of Design) and punch out the little leaf stems I had made a couple of weeks before during a 'play' session. The pretty lace trim I got from Ribbonbox at the Hinckley Sincerely Yours papercraft show in January and the pearl trim was salvaged ages ago from an article of clothing. All the flowers, beads, chain, charms and word brads were from my stash. I thoroughly enjoyed making this project and found it quite liberating to be doing something just for it's own sake and not with a specific person in mind. Thanks Elaine for choosing this project for our first one and thanks to Jean Hardy for the original inspiration. I hope you like it and enjoyed your visit. PS I prepared this post in draft this morning ready to publish this evening but I've had a bit of an accident, er .......................... slipped on the blooming slush, ice and sludge while walking the dog. Result - twisted knee and badly swollen foot which I can't bend or put weight on so I think maybe a visit to A&E is called for when Hubby gets home tonight. I'm hoping it's just a really bad sprain but I thought I'd best publish the post now incase I'm otherwise engaged tonight, Lol! Stunning Lesley, I really like this - my type of thing! I look forward to what you all will do next! Lesley - another triumph - you girls are setting such a high standard here!! I may just have to go into hiding with my project!! I am amazed how like Judith, you have bought so many elements and techniques together here. I love the muted lady and the lovely sepia cello image. This shows such a lot of your different skills Lesley and it is fascinating to hear where all the items come from for us stashaholics! This project comes together beautifully and it is great to see how different our styles and approaches can be, just from one source of inspiration. I think we are all learning a lot from each other in this process! I do hope your foot is OK and nothing is broken. What a treat this card is. I can't believe how something so original looking took its inspiration from a project with such a different feel. I'd love to be as bold with my colour choices as you, Lesley. These work so well together. I think the buttons on chains are a great touch. I've never seen that done before. This piece is stunning. Lots on there, but beautifully balanced both in quantity and colour. I LOVE it! Fantastic project. This is one that you want to sit and pore over for awhile and touch and feel all the little elements you built into it. Very lovely! I hope you are resting and not in too much pain. This is beautiful and is done in one of my favourite colour schemes - very subtle yet so detailed. It is great to make something just for no particular reason apart from enjoying the making. WSell done. WOW!! This is so VERY beautiful, everything just welds together in the most effortless way. Take care of yourself - no running around on that knee! Ooooooer Lesley, this is beautiful and right up my street! Love everything about it. Well done!! 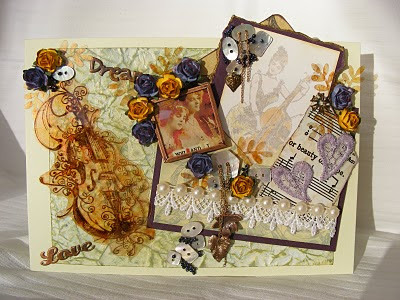 Well done Lesley, I love the colours that you have used, and the music theme is just great. The acetate cello and leaves are really lovely. I love the soft muted image inside your envelope. Lesley this is fantastic I love your theme and colours.